Christmas is over in the bakery for us and this year we baked over 550 dozen cookies. That’s over 6600 cookies! That doesn’t include the dozens of breads, pies, rolls and other sugary confections we made. Needless to say I got zero progress done on my SAL in the last three weeks. My hands needed a rest. I will have an update in January again with hopefully tons of progress made. I may not have gotten any stitching done this time but I am sure my other fellow stitchers made more progress than I did. Please hop on over to their blogs by clicking the highlighted links below. If you would like more info about joining our group’s stitch-a-long please contact Avis who is the first link in the group. This entry was posted in cross-stitch, Cross-Stitching, Project Onions and Gourds, SAL, Uncategorized and tagged cross-stitch Project Onions and Gourds by marymargaretripley. Bookmark the permalink. 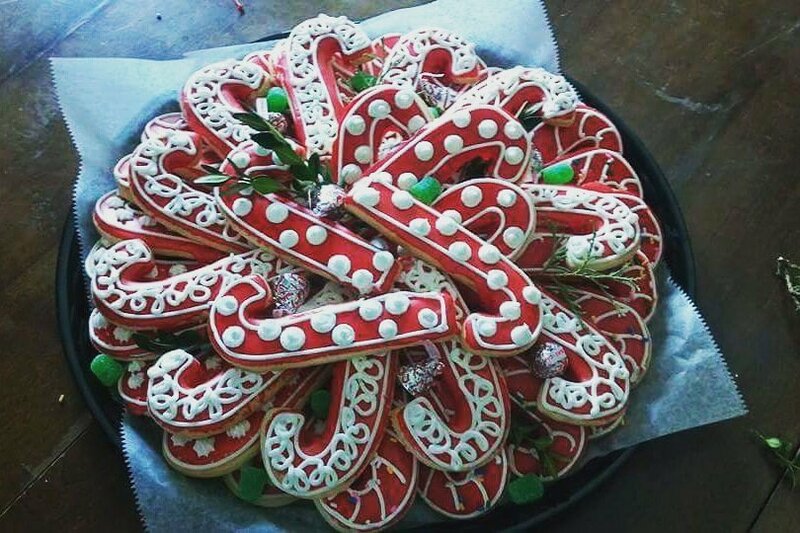 maybe no stitching, but those cookies look good! Oh my, those cookies look too good to eat. Don’t worry about the lack of stitching. There’s always next time. I hope to get lots more done in the next 3 weeks. You do beautiful work Mary Margaret, whether it be on fabric or food! Does making all of those treats make you NOT want any, or crave having some yourself? I don’t want ANY after smelling the sugar all day. I take a shower immediately when I get home or the cats will want to lick my ankles from the bakery smell and I eat a steak haha! Wow, that’s a whole bunch of cookies! and they look oh so delicious! There will be time for stitching in the new year. Yes, letting your hands rest is a good idea. Happy New Year! Those cookies look way too good to eat. Wow that’s a LOT of cookies. The look beautiful. Enjoy your rest, you deserve it. Wow, what a lot of cookies! And the candy cane cookies look wonderful. Bet there aren’t any of those left! Best wishes to you for 2018. See you in three weeks! Well you certainly have a good excuse for not stitching. I imagine you have been baking cookies in your sleep and I cannot even begin to imagine what that many cookies look like. They do get overwhelming very fast. Luckily the oven bakes 30 dozen in one shot.